We hope you enjoyed the hot weather last weekend, big up thanks for coming to our wild global sounds evening at Listen Festival in VK Concerts, what a blast! This weekend however, fresher times again, but also a good moment to get cosy inside and share the love for music, food and more. 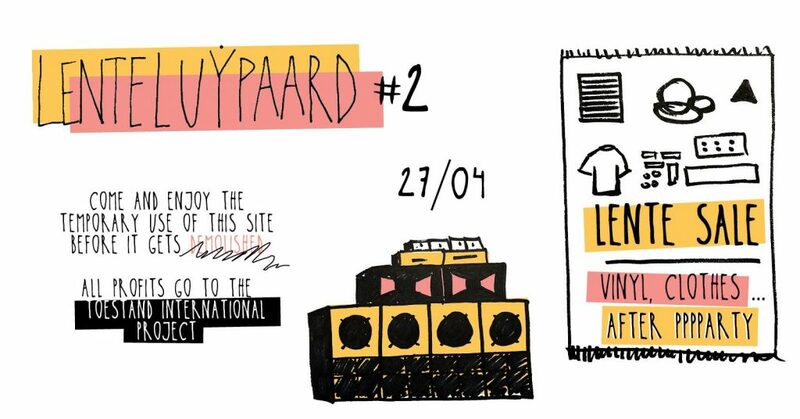 First up, saturday afternoon til the late evening (or beyond) > De Toestand organises the Lenteluypaard #2 market, spring sale of vinyls & clothes + afterparty in the Luypaard building (next to Zinzinerie). Rebel Up label & distro will be there with 2 crates of good tunes, come and check it out! 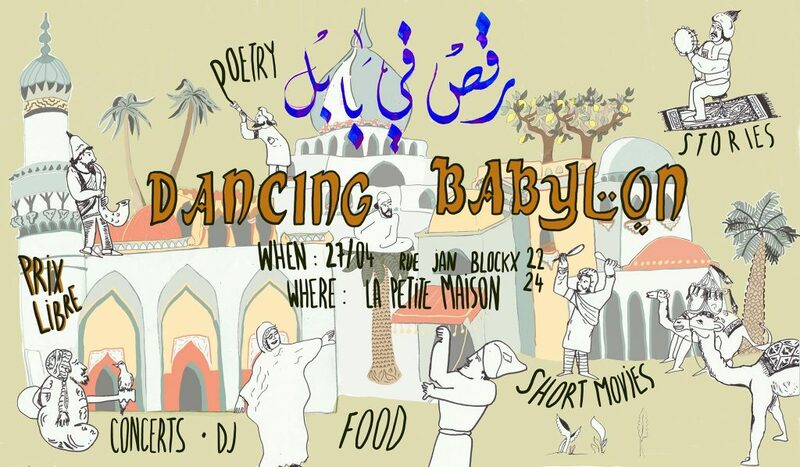 Then in the evening, over to Schaarbeek in La Petite Maison close the Schaarbeek train station, the Dancing Babylon evening, part of the MEDEX Tour du Monde en 183 Assietes. A special Iraqi evening with food, concerts, dj’s, short movies, poetry, stories, expo, afterparty and more. with concert by Iraqi musicians Saif Al-Qaissy (percussions) and Hussein Rassim (oud). Where? La Petite Maison, from 18h til 1am. 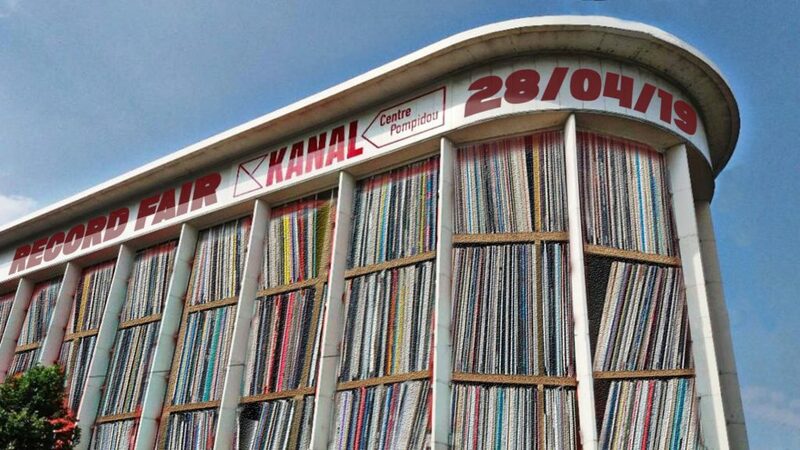 and on sunday afternoon, the Rebel Up disto will be at the Brussels Spring Record Fair in Kanal. New & 2nd hand vinyl, mainly focused around Black Music (Soul, Funk, Blues, Jazz, Afro, Latino, Hip Hop, House) with some detours trough Pop and Rock by some sellers. Also there will be a bike market. Free in! This weekend promises to be quite a busy one! – Rebel Up x Listen festival global sounds night! Rebel Up Records will be 2 days (saturday & sunday) at the Independent Label Market in De Hallen van Sint-Goriks / Les Halles de St Gery, with a lot of fine international & Belgian labels. FREE IN! Also in the basement of Les Halles St Gery, Poppunt will be hosting various talks on music and production. From 15h30 – 16h30, Rebel Up SebCat will moderate a talk titled The Emergence Of New Electronic Music Scenes Around The Globe, with special guests Arlen Dilsizian (Nyege Tapes), Amine Metani (Shouka), Sofyann Ben Youssef (Ammar 808) and Rrita Jashari (VK Concerts). Afro house, cumbia dub, Maghreb techno, Durban based GQOM. The last few years have witnessed an atmospheric rise of new electronic music genres, movements and scenes from all across the globe. Which cultural shifts are driving these changes? Who are the key players pushing these scenes forward? Arguably even more important: which new music should you definitely not be missing out on? Limited places have all gone (free registration), but perhaps you can still squeeze in there if reservations have been cancelled. Our Rebel Up curated global sounds night for Listen Festival with Ammar 808 (live), Susobrino (live), Gan Gah & Rebel Up DJ’s @ VK Concerts. Listen Festival, Rebel Up & VK concerts join forces for a global sounds night in the heart of Molenbeek at the historic VK Concerts venue. The night will take you on a global round trip with a multicultural lineup consisting of some of Belgium’s current top crop, between live acts and DJs. The international Northern African band AMMAR 808 عمّار brings berber folk styles together with heavy electronics and pounding bass for futuristic rituals. To complement the line-up, a live performance by Susobrino and his shamanic-inspired electro-acoustic Amazonian sounds, followed by global beat & bouncy bass DJ sets by GAN GAH (current artist in residence at VK) and the Rebel Up crew. See you there, if you dare!